Bryce grew up fishing the creeks, rivers, and ponds near Merry Hill, North Carolina. In his junior year at North Carolina State University he and several friends started the BassPack Club to learn more about the sport of bass fishing. He served as the club’s first vice-president and served two years as president of the multiple championship winning collegiate club. Bryce has been an avid tournament angler ever since getting involved with BassPack. In 2006 he won the Ranger Boats’ Basspack Angler of the Year and competed in the 2008 National Collegiate Bass Fishing Championship on Lake Lewisville, Texas. In 2008 he and his partner also finished in the top 15 in points in the National Bass Circuit Northeast Carolina division after fishing only four of seven tournaments. Bryce won the Century Bassmasters Angler of the Year points championship in 2009 over a sixteen year incumbent. 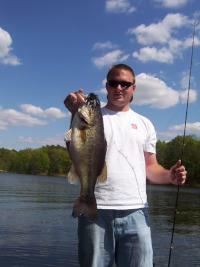 He plans to fish the Federation Nation team trail in 2010 and eventually ABA and B.A.S.S. weekend series events.